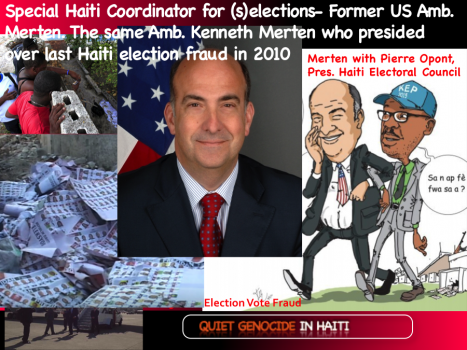 US election scam in Haiti with Kenneth Merten and Pierre Louis Opont, same occupation fraud, five years later... Sadly even more cartoonish. Testing the public's ability to stomach more of the revolting Martelly, Haiti Electoral Council, president Pierre-Louis Opont announced, on November 5, 2015, that preliminary results show Martelly's handpicked subservient, Jovenel Moise in first place at 32.8%. Jude Celestin, a protege of former president Rene Preval, garnered 25.2% for second place and is qualified with Martelly's stooge to go to the runoffs on December 27, 2015. Sen. Moise Jean-Charles, the most popular politician in Haiti today, is preliminary in third place with 14.2%. The Aristide candidate, Maryse Narcisse, came in fourth place with 7.05% percent. 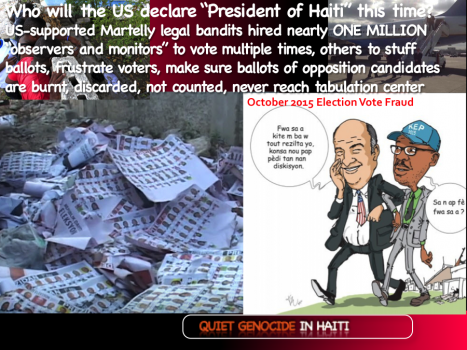 While the focus is on the sham elections, US puppet president Michel Martelly illegally privatized Haiti borders -- land, air and sea -- to former Israeli military officers at HLSI. This author broke the story at the article titled, Barbarians Inside and at Haiti Gates: Israeli HLSI and Eva Peled, and presented the horror the disenfranchised Haitian people endure under US occupation and the .05% percent Syrian/Lebanese/Israeli/Lebanon population in Haiti that own the Haiti economy through US white privilege patronage. These white oligarchs make up less than 1% of the population in Haiti but own 98% of the wealth through monopolies orchestrated and supported by foreign interests in Haiti. Did Eva Peled's Mitrelli Group donation to Clinton Foundation buy HLSI this $50million contract in Haiti? (See the signature line, here.) It seems Eva Peled's Mitrelli Group partnered with Eytan M. Stibbe on a $24,800,000 deal to Clinton Global Initiative. (See also, Video: Who is the Mitrelli Group ; Mossad in Africa, 'Aided by the CIA and American Trade Unions'. What could the new mercenaries replacing the UN troops in Haiti look like? Get a glimpse of South African Mercenaries turned "security firms" here, here and here. Haiti oligarch gangsters, drug traffickers and kidnappers buy their guns from the Israelis. The US Embassy and UN guns protect this wealthy cartel that gets their name -Gang Galil- from the high-powered Galil automatic rifles they carry. US election scam in Haiti, 2015 - Former US Ambassador Kenneth Merten with discredited Haiti Electoral Council Director, Pierre-Louis Opont. The West has two faces. One evil." Subscribe to the Ezili/HLLN youtube channel.